Her story began like a fairy tale. At the age of twenty-one, Farah Diba married the shah of Iran, Mohammed Reza Shah Pahlavi. In a matter of days, her quiet life was turned upside down: her coronation as the empress of Iran was covered in the world's press, and overnight she became an international celebrity. A loving marriage, the raising of four children, and a devotion to social and cultural causes marked her early years as queen, although there were already signs of grave national divisions on the horizon. Twenty years later the dream had turned into a nightmare: demonstrations and riots shook the country, and Farah and the shah decided to leave in order to avoid bloodshed. Seriously ill, the exiled shah would never again see his home. Together they sought refuge in Morocco, the Bahamas, Mexico, and Panama - hiding out in a New York hospital while the shah received treatment - until they were finally given shelter by Egyptian president Anwar al-Sadat, himself assassinated by fundamentalists just eighteen months later. The story of the shah's last years is one of the late twentieth century's most poignant and troubling episodes, as America's tense relationship with the Middle East began to reveal its flawed foundations. For the first time, Farah Diba - the shahbanou - wife of the last emperor of Iran, breaks her silence and tells the story of her love for a man and his country. An Enduring Love offers her intimate view of a time of upheaval, but stands above all as a powerful human document from one whose life was caught up in an epic and tragic national struggle. An Enduring Love : My Life with the Shah - A Memoir An Enduring Love: My Life with the Shah - A Memoir by, Empress Farah Pahlavi. Memoires (French Edition) Memoires (French Edition)A Memoir by, Empress Farah Pahlavi. Erinnerungen. by Farah Diba-Pahlavi Taschenbuch, 480 pages Published November 30th 2005 by Lübbe, A Memoir by, Empress Farah Pahlavi. 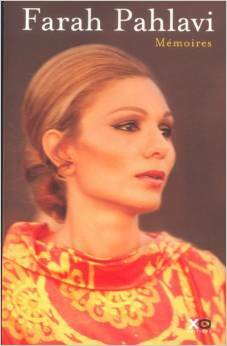 Por Amor Al Sha Y Al Iran Eterno (Autobiografia De Una Emperatriz)(Memorias) A Memoir by, Empress Farah Pahlavi.